The cattle markets have started to feel the same downward price pressures that have weighed on nearly every commodity market. From oil to corn and soybean, “too much” production has been a common theme. And while the cattle industry was looking to rebuild the cow herd, a recent surge of beef imports has also added to the beef supply. This week’s post takes a look at how significant beef imports have been. 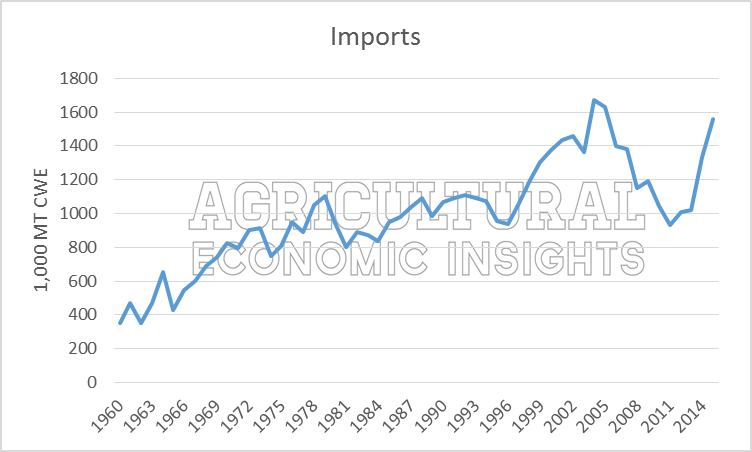 Using data from the USDA’s Foreign Agricultural Service (FAS), beef imports from 1960 to 2015 are shown in Figure 1. From the 1970’s to late 1990’s, annual beef imports were around 1,000,000 MT CWE (metric tons of carcass weight equivalent). From 1996 to 2004 beef imports increased from 940,000 MT CWE to 1,669,000. Imports then retreaded toward 1,000,000 MT CWE and stayed in the trading range through 2013. Since 2013, imports have been on the rise. From 2013 to 2015, beef imports increased from 1,020,000 MT CWE to 1,559,000 MT CWE. This 2 year increase is a staggering 53% increase. Suffice to say that beef imports, which from the 1970s to late 1990s were fairly stable, have been through some pretty dramatic changes in the last 20 years. Figure 1. U.S. Beef Imports (Meat, Beef and Veal), 1960-2015. Data Source: USDA’s FAS. While total tons of beef imports have changed, it’s important to consider imports relative to the total supply of beef. In figure 2, beef imports as a share of total annual supply is shown. 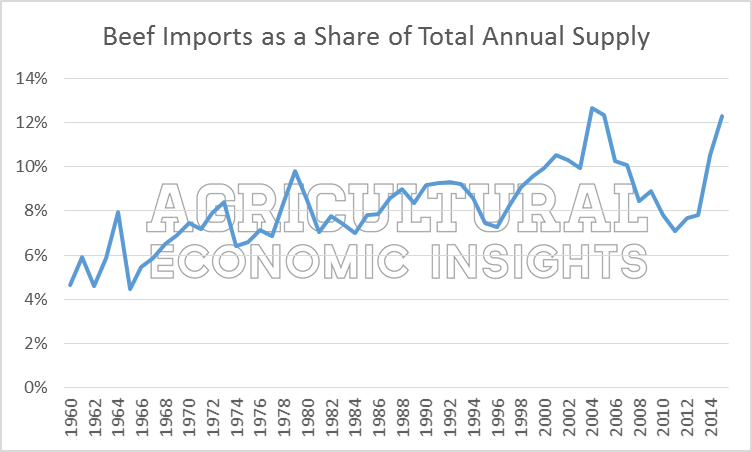 Similar to the trends in figure 1, beef imports accounted for about 8% of total supply from the 1970s to mid 1990s. Imports, as a share, expanded during the late 1990s through 2004 before retreating back around 8%. Currently, imports account for 12% of annual supply; slightly less than the record levels of 13% set in 2004. Figure 2. Beef Imports as a Share of Total Annual Beef Supply, 1960-2015. Data Source: USDA’s FAS. It is worth noting that from 2014 to 2015 the rise in imports played a very important role in beef availability. The USDA’s FAS reported that U.S. beef production in 2015 was 215,000 MT CWE less than 2014, or nearly 2% lower. However, beef imports were up 222,000 MT CWE, up more than 16%, and more than offset the lower production. Is a Strong Dollar at Play? In thinking about these beef import trends, the question came to mind if a strong dollar could be at work. The annual trade weighted U.S. dollar index is shown in Figure 3. The similarities between the increase in beef imports and a stronger dollar is quite striking. A strong dollar, all else equal, creates more purchasing power and makes it relatively cheaper to buy imports, such as beef. Looking over the last 20 years, beef imports and the strength of the dollar have trended in similar directions. Both rose in the late 1990s, fell during the late 2000s, and have again been on the rise. The greatest difference between the dollar and beef imports is that the dollar’s indexed value peaked in 2002 and began to drop while beef imports peaked in 2004. Of course this analysis is not nearly sufficient enough to suggest, or prove, strong beef imports were exclusively caused by a strong exchange rate. We are, however, simply highlighting the similarities and broad-level correlation. Figure 3. 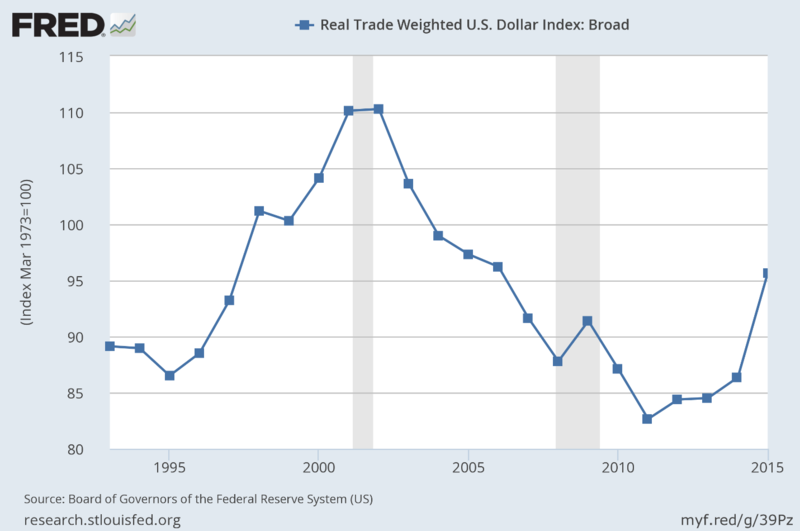 Annual Trade Weighted U.S. Dollar Index. Source: Federal Reserve Economic Data database. As the U.S. beef markets have recently come under price pressure, the role imports have played in the U.S.’s total supply of beef has been significant. Currently imports, measured in absolute (figure 1) and relative (figure 2) terms are historically high and rivaling the record levels set in 2004. Given the role a strong exchange rate plays in making imports relatively cheaper, it’s worth noting the relationship between beef imports and a strong dollar (figure 3). Often a strong dollar is cited in agriculture as creating challenges for exports, especially in grains. In this case, a strong dollar could also create downward price pressure by making imports accessible and abundant. The strength of the dollar into 2016 will be an important trend for the beef industry to monitor. Oh, and one more thing: In case this post has conjured up nostalgic memories of those 1990’s beef commercials, you can find one here.